Getting a free vehicle history for your car in Texas has never been easier! You can either search by VIN or lookup by license plate number. Running a license plate lookup is a great alternative to obtain a vehicle information when the VIN is not readily available. You must register your vehicle in the county where you currently live. After completing registration process, a registration sticker will be issued that must be displayed on the vehicle’s windshield or on the rear license plate of a motorcycle or moped. How To Register a Vehicle in Texas? Signed title and completed Application for Texas Title from the seller. Release of lien and/or power of attorney (if applicable). How much does it cost to transfer a vehicle title in Texas? Motor vehicle sales tax – 6.25 percent on the purchase price or standard presumptive value (SPV), whichever is the highest value. You may transfer your plates to your new vehicle. Your local county tax assessor-collector’s office will issue a new registration sticker for your vehicle. Remove the registration sticker on your old vehicle when you detach the plates. How long are Texas license plates good for? Texas license plates are good for 7 years. As of November 1, 2016, the State of Texas will no longer automatically replace your plates after 7 years. However, you may still apply at your county tax office for replacement plates if the license plate is lost or damaged. Do you have to have a license plate on the front of your car in Texas? Yes, Texas law requires that a vehicle displays two plates, a front and rear license plate. Buying a used car in Texas? Don’t make a costly mistake. 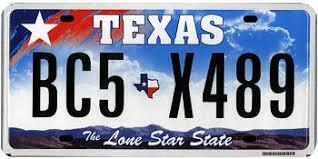 Run a Free License Plate Lookup for your Texas-registered vehicle! Run a Texas Free License Plate Lookup to uncover the full-story of your Texas-registered vehicle.